The interventions examine perception as if through a prism, opening up muted conversations with their museum context. Unobtrusive in their expert camouflage they blend seamlessly with the collections whilst they record the interaction and participation of their audience. 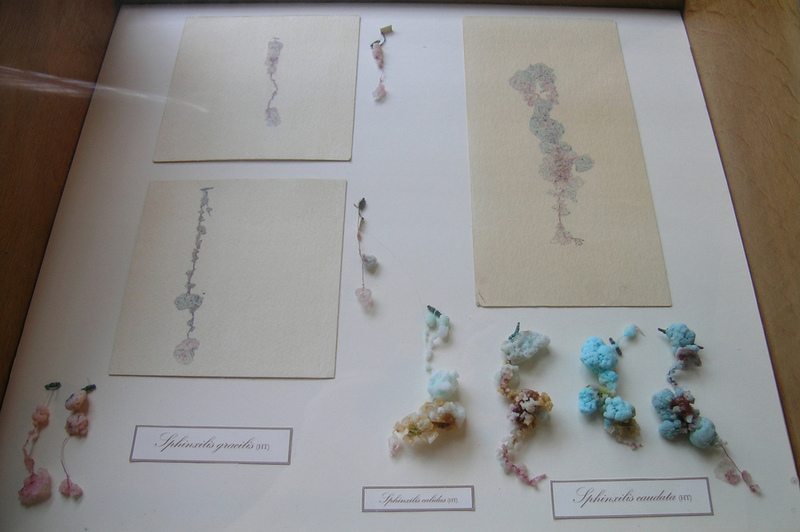 The Harold Thomas Collection consisted of detailed watercolours and salt crystals presented as undiscovered parasitic plant species found in the Congo by the fictitious anthropologist Harold Thomas. It was essentially an experiment in seeing, which encouraged the viewer to question the nature of authenticity whilst activating a dialogue with its museum context. It was exhibited as a genuine Victorian Natural History Collection in museums at: Rugby, Haslemere, Warrington, Shrewsbury and Oxford Natural History Museum; culminating with ARTifice - a seminar that disclosed the context in which the project evolved.